Everyone has a talent and mine, friends, is drinking wine. Just kidding (no not really). My talent is Beverly Hills 90210 trivia. Go ahead, hit me with your best questions. I’m sure you can’t stump me! Since I spent so many years in front of the TV watching the Beverly Hills gang grow, make horrible decisions (fashion and in life), and find themselves in unrealistic situations, it’s no wonder that so many times in my own life it all keeps coming back to 90210. And really, have truer words ever been spoken? Even when the show went off the air and the reruns were harder and harder to find, my love for 90210 never went away. The same was true for the actors on the show. I’ve followed their careers as they’ve played out on television shows, reality shows, their own books, and the tabloids. 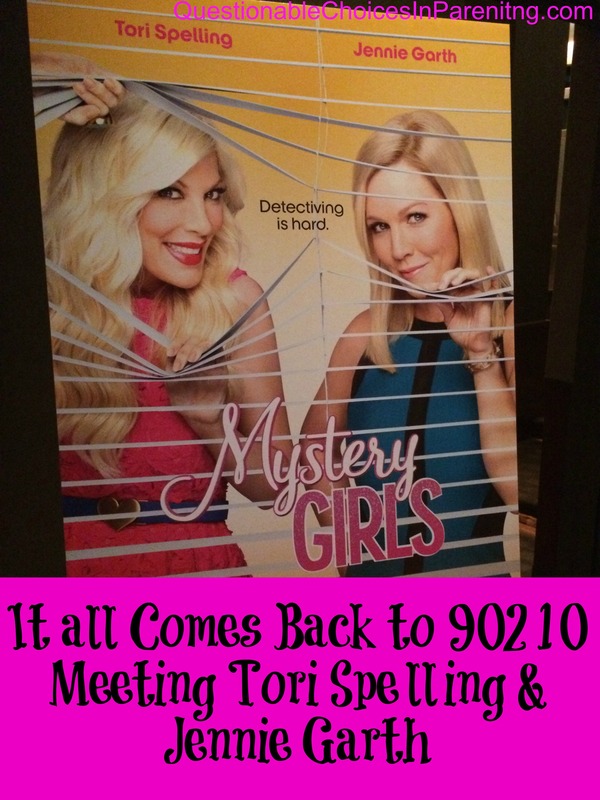 Years later I still really love Tori Spelling and Jennie Garth, and when I got an invite from the fabulous women behind The MOMS to head up to New York to catch a viewing of Tori and Jennie’s new show Mystery Girls, I about DIED! Then I panicked because I needed something to wear! While waiting in the small theater with about 30 other women, I was ridiculously excited. Sort of like Brenda Walsh before Spring Fling. We watched two episodes of Mystery Girls and, let me tell you, I’m hooked! The jokes were smart, the ladies looked beautiful, and watching Tori and Jennie perform physical comedy was such a change from their 90210 days and super entertaining. After the giggles died down and the viewing was over, it was time for a Q &A with Tori and Jennie. After the viewing and my line of questioning, surely Tori and Jennie wanted to be my new BFF–probably not but a gal can dream. The event was a blast, Tori and Jennie were smart,funny, and ridiculously beautiful in person, and NYC remains one of my favorite cities in the world. I’m so thrilled The MOMS asked me to attend this event and I wanted to hum the Beverly Hills 90210 theme song all week. You’re humming it now, aren’t you? 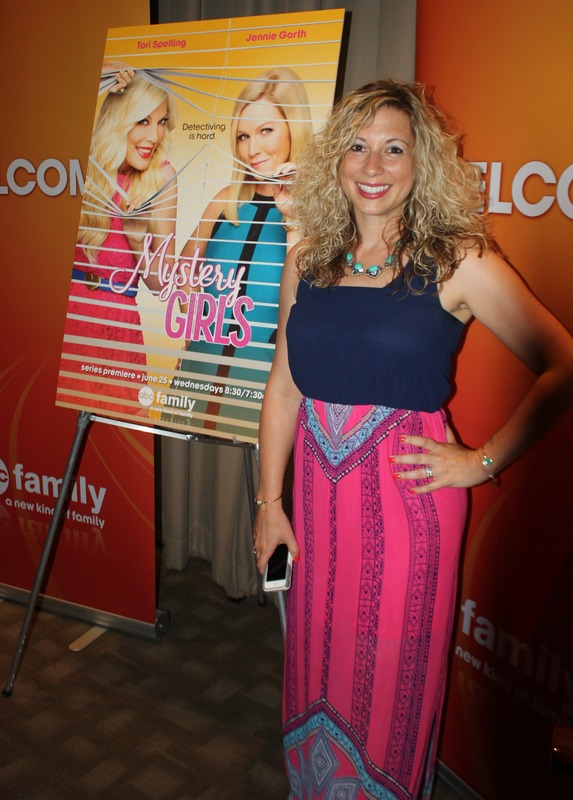 You can catch Mystery Girls on ABC Family on Wednesdays at 8:30! Dang. I’m always combining Brady and Ella’s birthdays. Ooops? And I’m sorry Tori, but it’s also about the CAKE. Obviously. Love your dress, your hair looked great, and what a fantastic experience!!!! I would have DIED, too! How seriously awesome is that and I am totally all over this show!!! I didn’t realize they were making a show together. I feel so out of touch. I’ll have to give that a shot. I sure loved them from 90210. Um, yes! 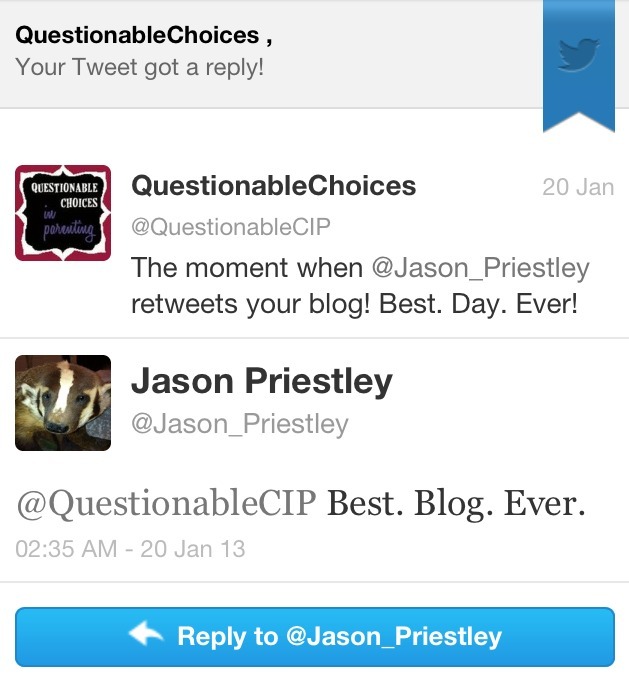 That is ridiculously cool that you were retweeted by Jason Priestly. I would have been super excited too. I just saw an ad for this new show and thought I might check it out. Small world! Also- I love the original 90210. What an amazing experience. I LOOOOOOVED that show. And Melrose came on right after it. I even got sucked in to the new 90210 before it went off the air. I have followed everyone’s careers. 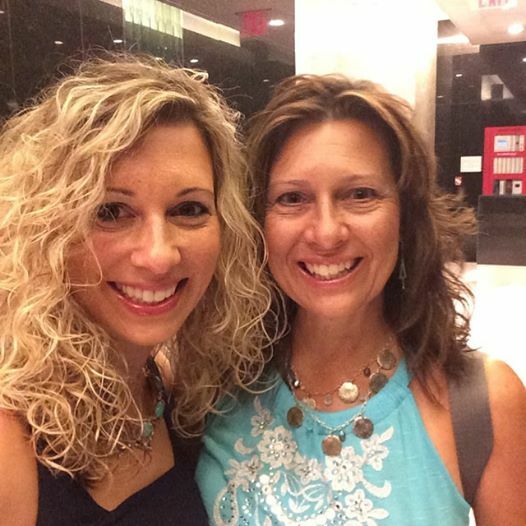 I often feel bad for Tori and Jenni with their crazy marriage stuff, but they are strong women and I love that about them! How exciting to be a part of that! My friend would have died in 90210 heaven! Tori Spelling is still so beautiful! I swear she doesn’t age. I remember watching 90210 growing up and was completely obsessed with it. I wish those great shows were still around. I can’t stand watching TV these days. I saw the picture of you on Instagram, but it didn’t register that you were at that event. The show looks fun! I’m rooting for something good for Tori. I loved Beverly Hills 90210! I hadn’t heard these ladies were doing a new show, I’ll be watching for it! How awesome that he saw your tweet and replied to you! I hadn’t heard about this new show, did it start already? How freaking exciting! I would of loved to attend this event this looks amazing! I bet this was a magical dream come true for you…I know the feeling when you have followed a show for a long time and you actually get to be in the presence of the celebs! I am so interested in the show now yay! How great that you got to meet them and have a QandA. By the way i love what you are wearing :). omg. i love it. and i can’t wait to see! 90210 was my favorite show for a long long time! I would love to watch it all over again. Netflix maybe? What an amazing experience!!! totally jealous. 92010 and then Melrose Place. Yep, we watched ’em all too. 🙂 This sounds like a fun event! I loved 90210 and Melrose Place. I can’t wait to see this new show! Oh I bet that was a blast! That is AWESOME that he RT’d you, always fun to see a celeb show some love! How fun to interview Tori and Jennie. And yes you do marry a Brandon. Ahhh I am so jealous!! I love Tori Spelling and Jennie Garth!! Looks like you had an awesome time! That tweet totally would have made me squee! I’m so excited for this show! So fun! All of it. My sis and I were truly obsessed everything and anything related to 90210. So classic. That had to be SO MUCH FUN! I used to love that show. I didn’t realize Jennie Garth and Tori Spelling were doing a show together. I bet you had a great time at this event. I just found out about this show. Sounds great. How did I not know about this show?! I’m a huge 90210 fan (own the seasons on DVD…not that I watch them religiously or anything), and this just makes my heart happy. I can’t wait to tune in!! You are so adorable! I love that you got to meet them and take over the questions (how do they look so damn young anyway???). I loved that show and remember when it ran back-to-back with Melrose Place. I think I held my breath for the entire 2 hours they played. OMGoshhhhh!!!!! I’m SO jealous!!!!! I LOVE 90210 and I’d like to think I could answer any trivia questions. LOVE that quote – ‘date Dylan, marry Brandon’ – so true! I think I missed the boat on 90210 by a year or two:( I am so happy that you got this opportunity- how fun! They look just as good too! Wow, what an event! We get to meet them soon too! Yep, I’m humming it! I watched the show for a few seasons and loved it, but I don’t have vivid memories of specific episodes, like spring fling. I’ll check out this new show- thanks! Ok before anything I have to say your Mom is so pretty! Love that you two are besties 🙂 And can you believe I was invited but declined the same event?! Work obligations but would have loved to have gone. I grew up watching 90210 so this interested me. I just got chills! I’m super excited about this. I still watch reruns of 90210 all the time. And yes, you always marry the Brandon, but you have to date the Dylan.